This morning the government stated "There is more money going into schools than ever before, rising to a record £43.5bn by 2020 - 50% more in real terms per pupil than in 2000." Let's deal with this nonsense. Firstly, the total spent on education as a cash figure is almost meaningless. Spending has to be related to the number of pupils, so is this an increase or a decrease per pupil? Also using cash figures is a sleight of hand that every government uses, as due to inflation, almost every year is a record year in cash terms. What we really want to see is the real terms spending. This is provided by the Institute of Fiscal Studies in their recent report and is set out below. We can see clearly from the chart that real terms spending has declined since the Conservatives came to power. When you add in pupil numbers the IFS find the real terms spending per pupil has declined by 8% since 2010. The final deception in the government statement is in the choice of comparison year. 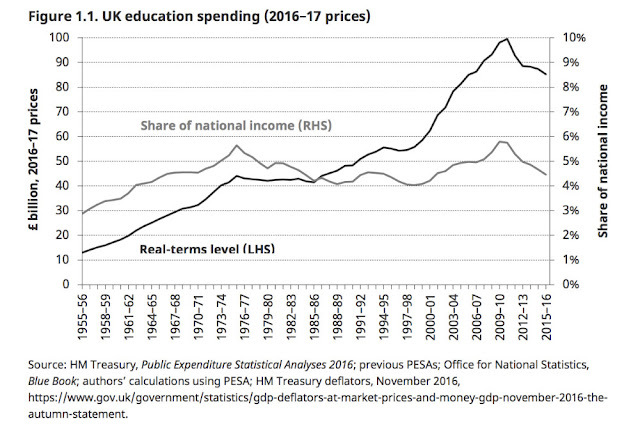 They say real terms spending per pupil is up 50% since 2000. This is true but it was the Blair and Brown governments that increased real terms spending per pupil. Once the Conservatives came to power, in coalition with the Liberal Democrats, they reversed this policy and reduced spending as we can see very clearly from the chart above. The government could make arguments to defend their decision to reduce spending but to try to claim they are investing more money is simply not true. Next they will be asking us to believe that Russian tourists are flocking to Salisbury to see the Cathedral spire.